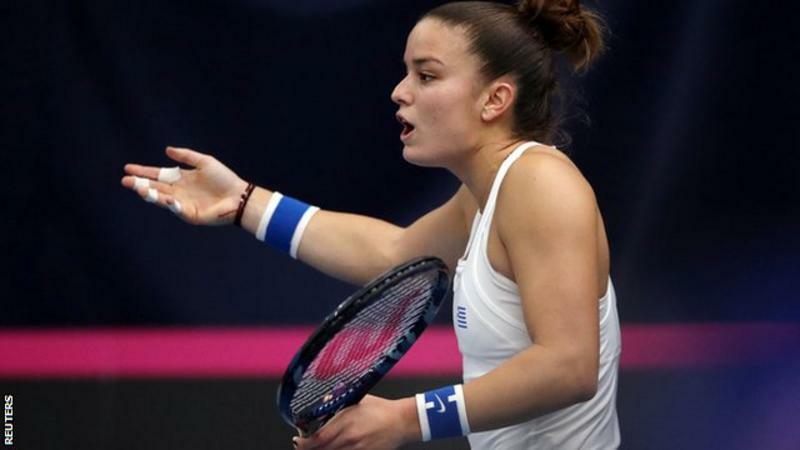 Greek player Maria Sakkari described the line judges as "the worst I have ever seen in my life" in her Fed Cup defeat by Britain's Johanna Konta. 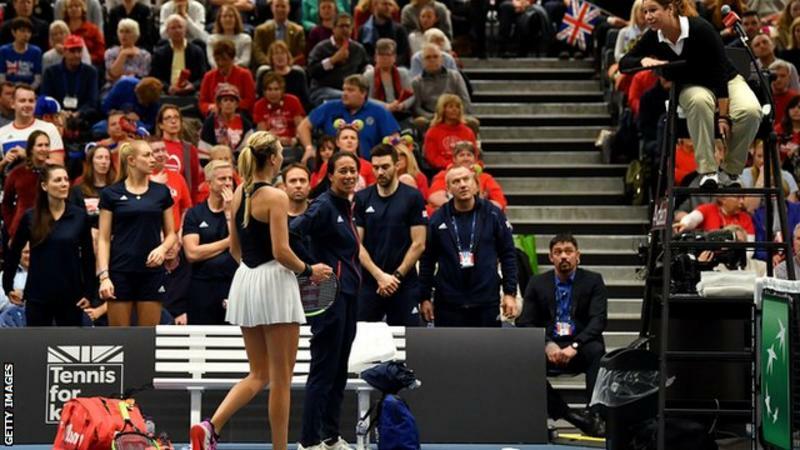 The world number 38 said they "were not professional" in a 4-6 6-2 6-3 defeat in Bath that featured a number of questionable calls. "This is unacceptable. They were making a lot of mistakes," Sakkari said. "We cannot have amateurs." "I think it was quite tough at both our ends but when it's such a tough match like that - so many heightened emotions - the line judges will feel the same kind of pressure, the same kind of stress," said Konta, whose win over Sakkari sealed victory for Great Britain in the Group A tie. "Everybody's human, but it was definitely a hard thing to contend with." The round-robin event - which is being held in Britain for the first time in 26 years - does not have Hawk-Eye technology to review line calls but Konta said "it's the challenge we face" and added it was "the nature of the game". Lawn Tennis Association tournament director Rebecca James said: "The officials selected for this event by the Association of British Tennis Officials (ABTO) have all worked at the highest levels of the game. "The chair umpires are internationally certified and selected by the ITF. The lines people are all paid, LTA licensed officials, who have worked Wimbledon semi-finals and finals between them, including many on previous Davis Cup World Group ties." World number 171 Valentini Grammatikopoulou, who had earlier lost 6-3 4-6 6-3 to British number two Katie Boulter, described the umpiring as "unfair" and "not so good". "I'm really disappointed," she said. "It's really unfair to play like this. Three calls were in deuce. You can watch it actually and I will show her the balls were out." "She [Boulter] deserved to win but let's play fair. That's why we play tennis, you know? Not to judge the lines. It's really tough. It's not about how she played, it's about fair play. "If the ball was out, I accept. If the ball was in, I accept. But not if it's really clearly out. It doesn't matter anymore but if I want to lose, I want to lose nice." "There were a couple of bad calls here or there, whether they were good or bad I don't know," said Boulter. "There was a let that I thought wasn't called - it goes both ways." GB captain Anne Keothavong added: "The line-calling today didn't affect the outcome of the matches. There were tight line calls. Some of the bad line calls went both ways, but that's tennis. "There was a lot of tension out there. But my brother's an official so I'm sympathetic to officials these days. It's not easy out there for them too."